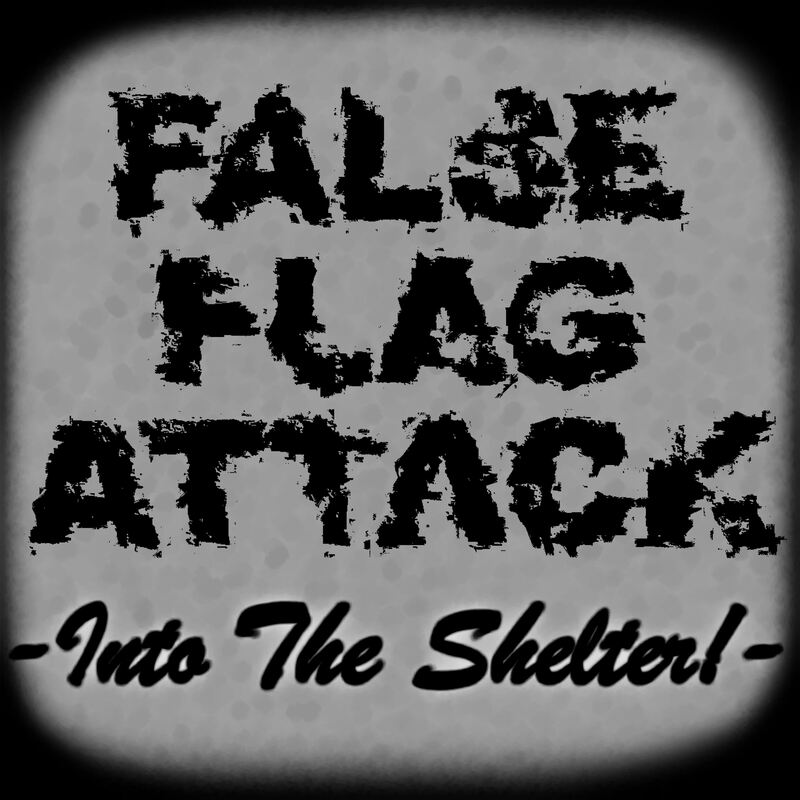 False Flag Attack – Into The Shelter! Germany, in the metal world, is known for Rammstein and Die Toten Hosen. Perhaps for grindcore fans Germany incites thoughts of goregrind delinquents GUT. But now there may just be another addition for the underground grind fans: False Flag Attack. If you’re hoping for a light-hearted listen, then turn away now, but if you want some serious and furious attitude, then read on. First of all, these guys do not shy away from politics and social criticism and are armed with only three instruments: guitar, drums and vocals. The only recently formed two-man grind machine are made up by Johann (guitars and drums) and Benny (vocals), and “Into The Shelter!” is their first EP, made up by seven tracks and clocking in at just over 9-minutes. The first track, Let’s Face It, is basically an intro featuring a sample of an old bomb raid instruction video (as might be heard during World War 2, or for today’s generation, the Fallout game series). While it has some almost comical cheery music in the background, this suddenly ends with sirens and the sound of a bomb explosion, the eerie gush of air going past your ears and the crackle of a radiation detector follows. Then the grind comes in. 7 Heads is a “go fast or die” style track, with a low, crunchy guitar tone and the drums are just pumelling. There’s some nice grooves too, not far from the style of Singapore’s Wormrot, and Benny’s vocals are just harsh and guttural to the point that it sounds like Tom Waits’s inner demon is raging. There’s also a cool groove-breakdown that makes it hard to resist to sway whilst headbanging. The next track Mass Graves, just 45-seconds long, is a post-apocalyptic flurry of riffs and d-beats, and has these downright weird tom toms at the end, something you might expect from humorous goregrind. The Hive is more all-out-grind and starts with 100-mph blast beats, muted riffs and retching vocals. The chugging choruses at the end are just catchy too, with it’s socially concious lyrics: “Burn it, the hive’s a lie and it’s / Taking, our open mind you better / Kill it, ’cause the hive’s corrupt”. Fallout is another sample-laden track, this time starting with eerie ambient keys and muffled sounds of bombs exploding, as calm instructions warn of the dangers of radioactive attacks with lines “You need to know about fallout: What it is, how to detect it, and what to do to protect yourself against it. Everybody needs to know”; which sums up the sort of urgent energy that this EP is full of. Into The Shelter! has a dire sound and features mournful lyrics like “Sirens make the folk despair / Bombs will turn us all to dust” and “Into the shelter / Mushroom lights the way to heaven”, so desperate as if it is about to happen, an inevitable reality. Lastly, Out Of The Shelter is another sample track, this time acting as an outro, with dramatic, crackled symphony as the crackles of radiation detection intensify towards the end. This is a solid EP, and with such quality of material and recording, there’s a lot of promise with these guys. Even though there is no new ground being tread here (although the post-apocalypse theme is interesting), False Flag Attack have a good sound going, and it’s clear this EP has been thoroughly thought out, and the samples really act as nice breaks and hype-tracks. While there’s only four tracks of actual grindcore, there’s nothing here to complain about – in fact the actual grind tracks has you revisiting what you were given repeatedly. “Into The Shelter!” is a short and sharp offensive on your senses, pure nihilistic grind, full of heavy riffs and grooving drums. Worthy of being in any grind fan’s iTunes. Favourite tracks: The Hive, Into The Shelter!.